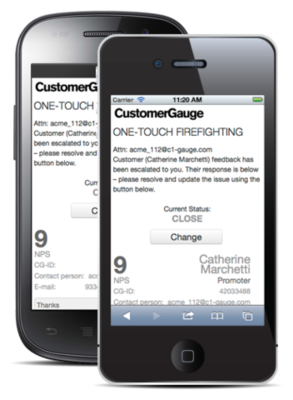 CustomerGauge, the customer feedback and analytics Software-as-a-Service based on the Net Promoter® System, has launched a new feature called One-Touch Firefighting that enables users to be alerted to and manage workflow status from a mobile device. The functionality gives new capabilities to customer-focused enterprises, and the ability to resolve customer issues within minutes rather than days. "Closing the loop is a crucial part of implementing a successful Net Promoter System, and leading organisations use a time-elapsed metric by measuring how long it takes to resolve issues with customers," said Adam Dorrell, CEO, CustomerGauge. "One-Touch Firefighting improves internal accountability by making workflow accessible to CustomerGauge users no matter where they are or what they are doing." One-Touch Firefighting has a rules-based system to prioritise alerts and direct them to the right person in the organisation. It alerts users such as account managers or key executives on their mobile device, giving all the details of the case necessary to make initial customer contact. After contacting the customer, the user can simply touch one button to mark the new status of the case, or close it directly. One-Touch Firefighting is designed to work simply and effectively with zero or minimal training. "According to our own research, organisations that make the effort to follow up on customer issues record an average Net Promoter Score up to eleven points higher than those that do not," said Adam Dorrell. "As part of our mission to provide our clients with the full suite of tools they need to keep promises to customers on time, every time, One-Touch Firefighting is a powerful complement to the standard CustomerGauge Firefighting tool." Read more about One-Touch Firefighting here. The CustomerGauge Firefighting tool is a powerful feature used by B2B and B2C organisations such as Nilfisk-Advance and Kuoni to close the loop with customers. It can be configured to open a case automatically under a range of circumstances, including if the customer requests follow up via a "Please contact me" box on the survey, or gives a Net Promoter Score in a pre-defined range. Once a case is opened, a workflow box is used to manage the follow-up process, which includes a place to record comments and information about the case, and status options including Open, In-progress and Closed. Users can create rule-based workflow to route responses to the right person in the organisation. CustomerGauge is a software-as-a-service platform that helps clients improve retention, using Customer Success and Net Promoter® methodologies. The system automatically measures, analyses feedback and has close-loop tools to grow sales by retaining customers better. Results are published and analyzed in real-time, using a highly customizable and flexible reporting tool, which is scalable from small/medium companies up to global enterprises. Founders Adam Dorrell (CEO) and Camilla Scholten (COO) launched the company in 2008. Headquartered in Amsterdam (base for all development and marketing), it has offices in Boston and a growing Asia/Pac business. Clients include Electrolux, Philips, WoltersKluwer, AEGON, Ziggo, Tommy Hilfiger, Melitta, H&R Block and Alphabet/BMW. CustomerGauge was recently recognized for its growth in the Deloitte Fast50 companies listing for 2015. *Net Promoter, NPS, and Net Promoter Score are trademarks of Satmetrix Systems, Inc., Bain & Company, and Fred Reichheld. In their latest groundbreaking publication, CustomerGauge offers a new path forward for B2B enterprises struggling to define a customer experience strategy in an account-based world. Customer Success leader with over 30 years of experience will direct the global CSM team for the rapidly growing SaaS company. Less than a month away, CustomerGauge is gearing up to Monetize! Amsterdam with record number of registered attendees and groundbreaking B2B capabilities on the way. Following the success of their 2018 Monetize! conferences, CustomerGauge kicks-off 2019 with an all-star lineup for Monetize! Amsterdam. CustomerGauge’s Reporting and Analytics, as well as Professional Services tools, have been recognized in Gartner's 2018 Market Guide for Voice-of-the-Customer Solutions. This is the second consecutive year in which CustomerGauge is included in Gartner's report for its VoC technology.